Silver grey insert. 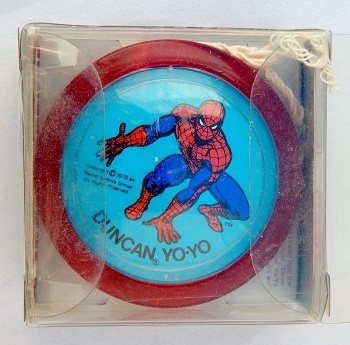 Unlike the Duncan Super Hero Magic Motion series, this Super Hero series used static images on both sides of the yo-yo. The profile of this yo-yo is identical to the Duncan Professional. On one side is a scene of Spiderman climbing a wall with "Duncan Yo-Yo" above him in black lettering and "The Amazing Spider-Man in white lettering; the opposite side shows the character crouching with one hand on the ground and "Duncan Yo-Yo" in black lettering below him. The metal axles on Duncan Super Hero series yo-yos were Reslon coated. Some people refer to the coating as Teflon, but that is incorrect. Reslon was Duncan's own thermal bonded fluorocarbon resin coating that reduced friction between the axle and string, and allowed up to 20% longer spin times. Reslon axles were also used on Duncan Imperials in the early 1980s. The Reslon trademark, owned by Flambeau, was officially registered August 28, 1979. On December 15, 2000 the trademark was cancelled.